We provide a professional and efficient Easy Read service to all sectors, as part of our commitment towards improving access to information for all. 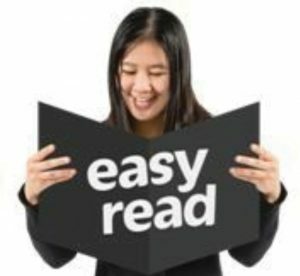 Easy Read is an accessible format that makes written information easier to understand. The Easy Read format is easy to understand because it uses simple, jargon-free language, shorter sentences and supporting images. Why produce Easy Read documents? The Equality Act (2010) requires organisations to produce information in an accessible format. Easy Read can ensure that disabled people have equal access to information and are not discriminated against. Disability Equality Scotland offers an Easy Read service based on the word count of your document. For more information, download our Easy Read Pricing Policy.